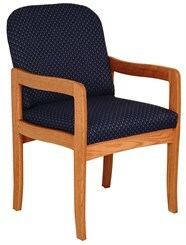 An excellent value in solid oak frame guest seating. 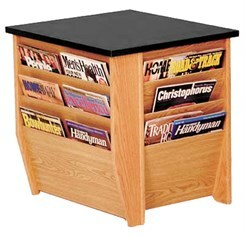 Choose with or without arms and matching magazine tables. 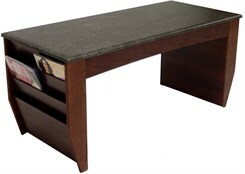 Coordinating tables have neutral graphite thermofused melamine tops. Complies with California Code TB117. Easy assembly. 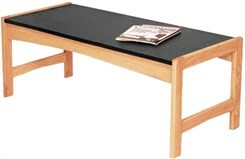 * Solid 1" oak framework in Light or Medium finish. * Durable thermofused laminate table tops. * Strong & easy metal-to-metal assembly system. * Quickship in 18 fabrics/vinyls and 2 frame finishes. 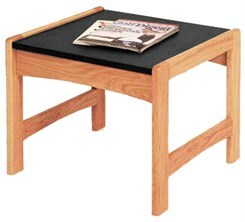 Measures 21-1/2"W x 26"D x 37"H overall. Shpg. wt. 28 lbs. PRICE INCLUDES FREIGHT! Please allow 2 weeks for delivery. 1 - 2 $209.00 ea. Measures 21-1/2"W x 26"D x 37"H overall. Shpg. wt. 28 lbs. PRICE INCLUDES FREIGHT! Measures 21-1/2"W x 20"D x 18"H overall. Shpg. wt. 30 lbs. PRICE INCLUDES FREIGHT! Measures 48-1/2"W x 20"D x 18"H overall. Shpg. wt. 50 lbs. PRICE INCLUDES FREIGHT! 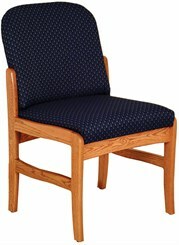 Measures 20-3/4"W x 19"D x 21"H overall. Shpg. wt. 50 lbs. PRICE INCLUDES FREIGHT! 1 - 2 $379.00 ea. Measures 46-1/2"W x 20-3/4"D x 21"H overall. Shpg. wt. 50 lbs. PRICE INCLUDES FREIGHT!